Here In Hope is a history of place, a spiritual and ecological memoir, and a biography of the community of Hope, British Columbia. J.M. Bridgeman tells the stories of this land and its people with both a mystic's sense of wonder and a scientist's curiosity about the precise nature of the forces that shape our world. 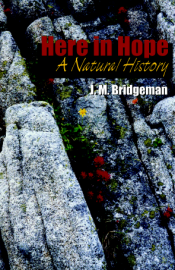 Elegantly written in precise lyrical language, Bridgeman describes the evolution of the place called Hope, and gives voice to the forces that have shaped this unique area.The story of Hope begins with a narrative of geological forces: the collision of mountain ranges, the slow grinding of earth by glaciers and ice, the carving out of valleys, and the convergence of two great rivers.Human habitation then enters this landscape, firstly with Aboriginal settlers who lived lightly on the land and saw in the mountains and rivers the sacred interconnectedness of all life. Then come the explorers and fur traders who moved into the area.Next comes the discovery of gold in the Fraser River, which brought a rush of inhabitants with their European-shaped ideology of human dominance over nature. And as the world chugged into the industrial age with its railroads, new technologies, and more immigrants, the ecology of this pristine environment changed profoundly.